This is a weird one. 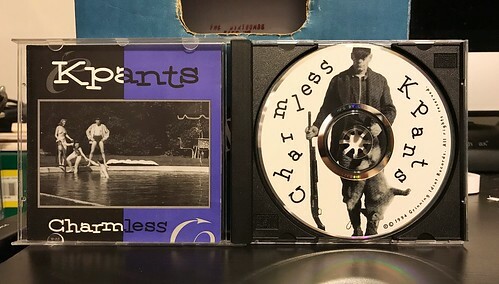 I've known about and listened to Kpants since the mid 90's when discovering them on a compilation called I-5 Killers. I have both of their 7"s and I've been listening to this album for years. Yet somehow, I didn't have a copy of this record. I don't know how that's possible. I'm not sure if I'm the only one that has issues with their record collection eating albums and having them disappear forever, but that sure seems to happen to me from time to time. Anyway, I've added this back to the collection, so I figured I'd write up a bit about them as they're a band that definitely didn't get their due. The funniest part about Kpants is that I was, at first, completely infuriated they existed. Why? They stole the band name I wants to use in high school. It's from an episode of the show Get A Live, when Chris gets food poisoning, suddenly becomes an amazing speller and finally realizes that the word pants doesn't have a silent K at the beginning. I couldn't believe someone else decided to use that. But after I got past my initial frustration I came to realize what a quality band Kpants really is. They have a crunchy guitar sound, not unlike an early era Small or similarly poppy Chapel Hill style band. They don't go as far our there as an Archers of Loaf, but they have the same sort of gruff vocal tendencies and dynamic hooks. They're just a bit more straightforward, again kind of like Small (or Small 23 if you prefer). I could honestly do with out the slow ballady "She's Got You," but aside from that one song, the album is just loaded with fuzzed out rockers. It's a worthy addition to the collection of any self respecting, aging indie rocker. I read somewhere that the band's unreleased 2nd album was finally going to be released, but that was posted a few years ago and I haven't seen anything since. Anyone else know anything about that? I didn't hear anything about a second Kpants album, but I've been sharing a link to this album, and offered some thoughts of my own a few years ago. Boilerman - Doing Great 7"
The Practice / What-A-Night's - Split 7"